If you're going to make your Pumpkin Pie from scratch for Thanksgiving, definitely roast your pumpkin seeds instead of throwing them away. It's super simple to do and they're a healthy snack for the whole family. You can roast them plain with a dash of salt, or spruce up the ingredients to make a BBQ version like I did here. Enjoy! Remove the seeds from the pumpkin and separate them from the stringy pulp. Rinse the seeds in a colander under cold water. Shake off any excess water. 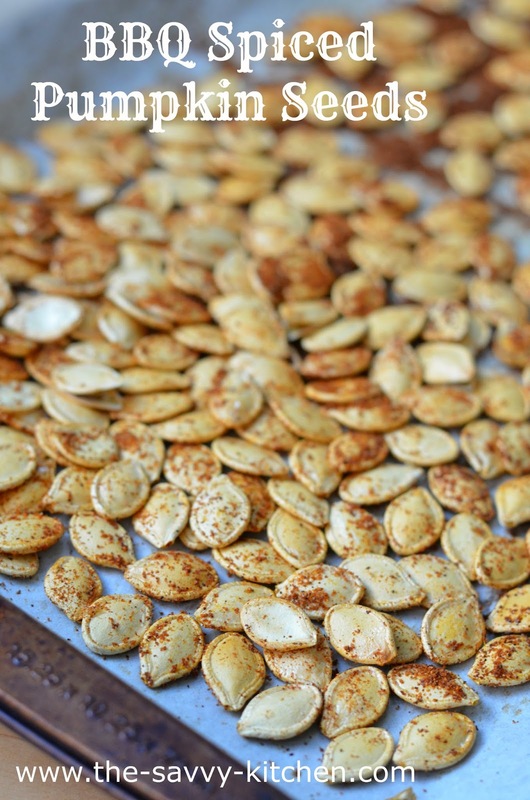 Spread the seeds on a baking sheet and roast for about 10 minutes or until seeds are dry, tossing halfway through. In a small bowl, combine the onion powder, garlic powder, mustard, smoked paprika, cayenne, salt and brown sugar. Remove the seeds from the baking sheet and place the seeds in a medium bowl. Lightly spray with oil. Add 3/4 of the spice mixture to the pumpkin seeds and toss to evenly coat. Cover the sheet pan with parchment paper and spread the seeds evenly on top. Roast for 20 to 30 minutes or until brown and crunchy, tossing half way through. Remove from oven and immediately spray more olive oil over the seeds. Toss with the remaining spice mixture.